Tonight will see the debut of the hotly anticipated Dallas reboot, 21 years after the original show ended. So the cast of the new version yesterday got the opportunity to quite literally ring in their show at the New York Stock Exchange. 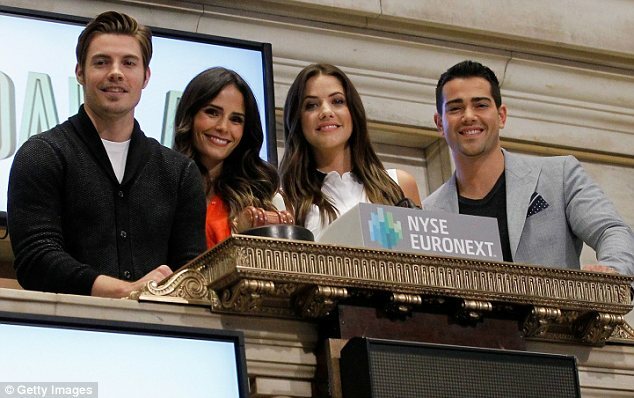 Josh Henderson, Jordana Brewster, Julie Gonzalo and Jesse Metcalfe were given the prestigious honor of ringing the bell to open up trading on Wall Street. Jordana Brewster and Julie Gonzalo looked glamorous as they posed up together before heading to the podium where they joined their male co-stars Josh Henderson, 30, and Jesse Metcalfe, 33, to ring the opening bell. Jordana Brewster, 32, opted for a color block outfit, tucking a red blouse into coral shorts and topping off her look with a white blazer and tan wedges. Meanwhile, Julie Gonzalo, 30, chose a monochrome ensemble and sported a white shirt dress which boasted a black belt and collar with a pair of black peep toe shoe boots. As the younger generation drummed up excitement for their new series, the original cast-members of the hit show were appearing on the Tonight Show with Jay Leno. Larry Hagman, Patrick Duffy and Linda Gray, who also star in the new series, all took to Jay Leno’s sofa to promote the return of the Texan-set TV drama. It seems that the surviving original cast are just as excited about the return of the show as the younger set are to join the ranks. Although the new edition is regularly described as a reboot, Patrick Duffy, 63, has said that the correct term for the new series should be a “continuation”. The plot will still centre on the Ewing family, in particular John Ross Ewing III who is the son of JR and Sue Ellen, and Christopher Ewing, the adopted son of Bobby and Pam. Dallas premieres in the US on TNT on June 13.